You know if Cap, Sabretooth, Cosmic Boy or Judge Dredd had an MP3 player, the one song they'd all own to get them ready for fight and rise up to the challenge of their rivals would be Eye Of The Tiger. The one-hit wonder of U.S. rock band Survivor has been pumping up every training session and sport stadium since its birth in the 80's. It's been played to annoy neighbours on Sunday morning, it's been played at bar mitzvahs and weddings, divorces and birthdays. Played on the piano, the keyboard and panflute. 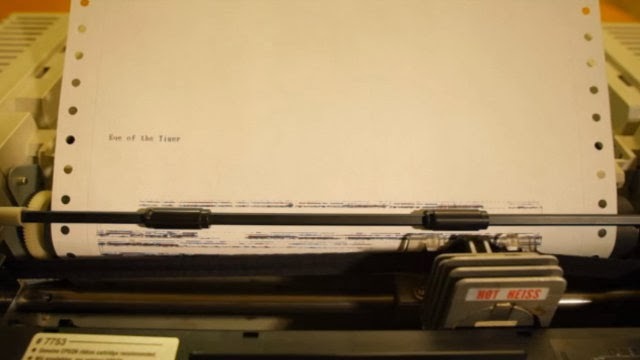 And now it's been played on the typewriter (yes humanity has kept one around), and better yet, captured on video. Turn your speakers to sub-woofer and hit play! I'm glad ya dug it King. I played it for a room full of people Saturday and I'm not sure half of them got was cool. Crazy I know!